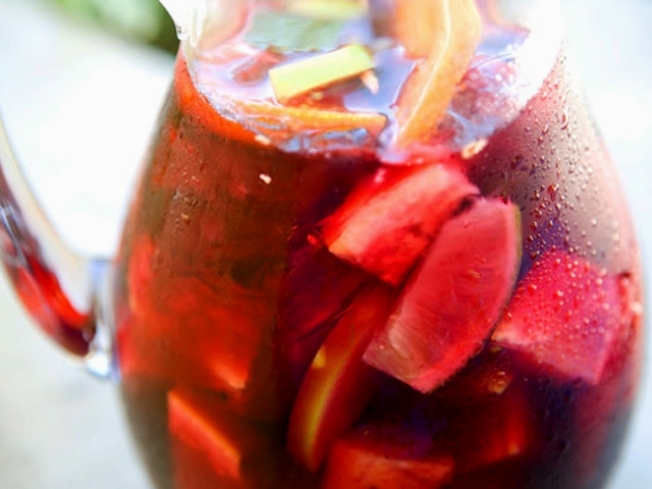 Grab a refreshing glass of sangria at Mission Grill. They're cheap any day of the week. VIVA FUTBOL: The World Cup is into its second week, and even if you aren't the biggest soccer fan, you can still celebrate the festivities. Vivo restaurant at the Marriott Hartford Downtown is getting into the soccer swing with South African wines and Sangrias tonight. How's this sound: Their White Sangria features Indaba Chardonnay, rum, sugar, orange juice, oranges and lemon-lime club soda. If red is your thing, the Berry Sangria includes Mulderbosch Rose' wine, sliced strawberries, raspberries, ginger ale, sugar, lemon and oranges. So enjoy all the World Cup fun without the Vuvuzelas (if you don't know what those are by now, get with the program). IS THIS THING ON? : So if you've ever thought about getting up in front of a crowd for an open mic night, now is your chance. Russell Restaurant in Hartford is hosting The Love Jones Experience tonight at 9 p.m. It's a poetry reading, and it's open to whoever wants to be heard. There's a happy hour from 4 p.m.-6 p.m. with half-price appetizers, $6 martinis and $3 drafts. There's a $5 cover charge after 7:30 p.m. FEELING THE RHYTHM: If you really want to treat yourself tonight, head to Mohegan Sun for two of the biggest names in R&B. Maxwell and Jill Scott are teaming up for a show promising to be a great night of music. Maxwell (you remember his hit "Lifetime"), is supporting his 2009 release BLACKsummers'night. He'll be joined by Jill Scott who is planning on releasing her first studio album since 2007 this summer. Tickets are $77 and $57. The show starts at 7 p.m.